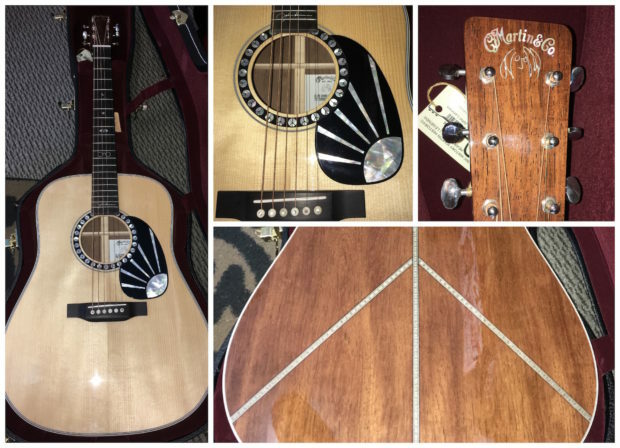 This is the Martin D-28 John Lennon 75th Anniversary Acoustic. It was limited to only 75 manufactured worldwide, to commemorate John Lennon’s 75th Birthday. It arrived here at Modern Music this week at a retail price of £9000.00 and was instantly sold to one of our customers. We think it’s great that a guitar of such rarity and value can be sold in Cornwall, and shows the strength of our local love for music. Modern Music will always strive to bring these interesting and rare guitars to Cornwall, which allows our local customers to purchase guitars of this rarity without having to visit any other retailer in the UK.